On January 17th, the St Petersburg School of Decorative Art, an educational institution comprising college and university, witnessed a meeting of Sokolniki MEC correspondent and Pyotr Chobitko, the teacher and active promoter of calligraphy. After a short talk in the School Lobby, the interlocutors moved to the classroom where Chobitko’s students were preparing for examination. The initiative to organize the International Exhibition of Calligraphy aroused the students’ genuine interest. They were posing with pleasure for Sokolniki MEC official website. Viktoria Lysenko, the wife of Mr. Chobitko, his soul mate and active supporter of the exhibition, joined our conversation. The long interview took several hours. During the conversation, we found out that calligraphy is not a mere art form, but also an attempt to preserve the tradition of the Russian writing, broaden the youths’ minds and improve their leadership. They mentioned some radio programs dedicated to brain training at the inclined desk and necessarily with an ink pen, as in good old schools. «Calligraphy is a powerful incentive for creative activities... Calligraphy can protect us from aggressive environment. 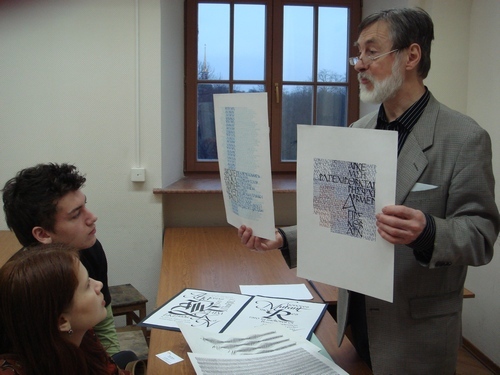 It keeps the soul in harmony», thus Pyotr Chobitko addressed the team of the International Exhibition of Calligraphy. 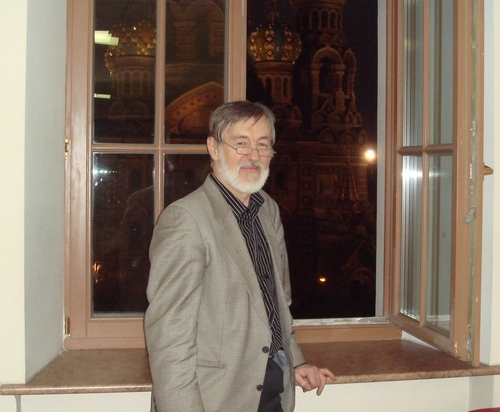 Pyotr Chobitko and his wife promised to come to Sokolniki for the official opening ceremony of the project on February 15th, 2008.